Here are Janice's and my ATCs for the month of December. Mine is a simple little Noel angel made from paper and hand decorated with gold pen. Janice has made a beautifully stamped and gilded card. 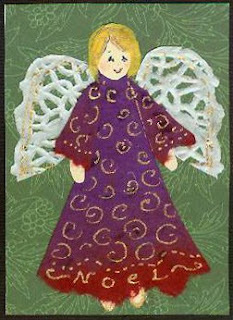 You can see her whole series of beautiful advent cards on her blog. My mom was an avid needleworker. 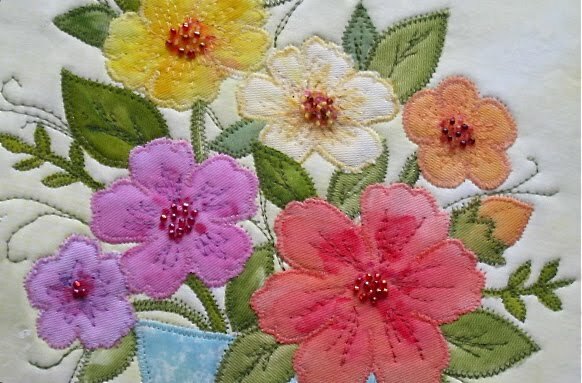 She did beautiful crochet, needlepoint, knitting, embroidery and wool rug hooking. No wonder I love handwork and textiles! I can close my eyes and picture her fingers flying as she worked on a baby blanket, an embroidered tablecloth or an intricate knitting project. When we cleared out my parents' apartment after their deaths, I took home a plastic bin containing her needlework supplies. Among the yarn, needles and embroidery hoops, I found this unfinished scarf, still on the needles, neatly folded, along with the hand written directions. Since I haven't knitted in about 40 years, I asked my talented friend SooKhim to finish the scarf for me. She graciously finished it, blocked it and delivered it to me just in time for the frigid weather we're now experiencing! I think my mom would love that the scarf is finished and I can feel her warmth and love wrapped around me when I wear it. This week I received in the mail this wonderful book which I had ordered from my friend, artist Terri Stegmiller. The book is full of ideas, tools, techniques and examples of how to go about creating unique works of art using paper in various forms. Included are instructions and some patterns, along with examples of work by several artists. 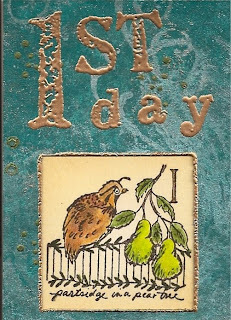 Along with it, Terri sent a beautiful handmade ATC, pictured in the lower left of this photo. I can't wait to try some of the techniques in the book! 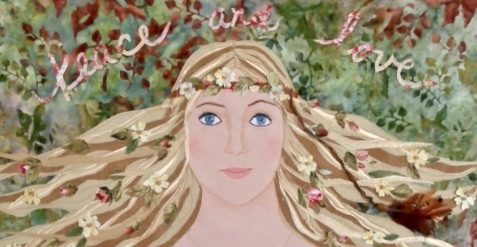 Visit Terri's blog where you can find more information about her work and her book. My friend Janice sent me this ATC for November. She had asked me if she might use my abstract design and I agreed, but nothing prepared me for this mini replica of my picture, done in green tones rather than brown. I absolutely love it, Janice, and, as I told you, I actually like your colors better than my own!! My own ATCs for November and December have gone off in the mail to Janice, and I forgot to scan or take pictures of them!! Oh well, too much going on these days - hard to keep track of everything!! Recently I received this amazing surprise package from my friend Beverly of Teatime and Roses. In it were handmade gift tags, tissue paper, gift bags, candy, a Santa ornament and four packages of lovely printed papers! I cannot wait to use those papers for some cut paper artwork, and the Christmas goodies will definitely be used on holiday gifts! Beverly's blog is a warm, elegant place to visit - a reflection of her gracious personality. Thank you so much, Beverly!!! Here are more fabrics from my burst of energy last week! One thing I found out about myself is that I definitely gravitate toward certain colors, especially greens, oranges and reds. These are the colors I reach for over and over again! On these fabrics I used sponging, stamping and layering, as well as dry brush strokes here and there. Although I found stamping with paint a bit tedious, the whole painting process was very freeing and something I want to do more of. Last week I spent parts of several days painting fabric with Setacolor paint. On some fabrics I experimented with foam stamps to create patterns. On others I just enjoyed painting and blending color right on the wet fabric. And I also played with painting with different colors, then sprinkling the wet fabric with coarse salt to draw the colors into patterns. I came up with a nice pile of small pieces of original fabrics which I plan to work into some abstract appliques. Something new for me - very enjoyable!! I actually find it very interesting to use commercial fabrics in my work, but I think a bit of hand painted fabric will add an extra special touch. We'll see...! 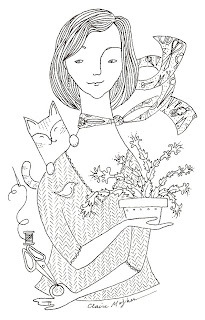 I really love the whimsical, funny and elegant drawings of Claire Mojher. So, for my birthday recently, I thought it would be fun to order from her a portrait of myself! She asked me questions about my favorite things and animals and I told her about my obsession with scissors, my mom's Christmas cactus, my cat and other details about me. I was tickled by the result! I'm thinking of having pictures of my husband and daughter done, and framing them all together. I visit Claire's blog often and I'm always charmed by her originality and sense of fantasy. Pay her a visit and see what I mean!